IPI and British Parking Association’s Technology Glossary for Parking ProfessionalsIPI and the British Parking Association (BPA) have released the Technology Glossary for Parking Professionals in the UK, the result of a collaboration between the two associations. The new glossary defines parking technology terms to help industry professionals better communicate with their peers, those in related industries, suppliers, and the public. 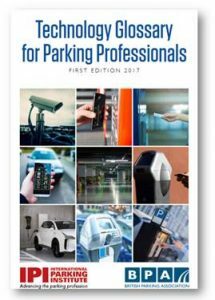 Members of IPI’s Technology Committee worked with BPA members to write this A-Z glossary of parking technology terms. It is available as a free download here.